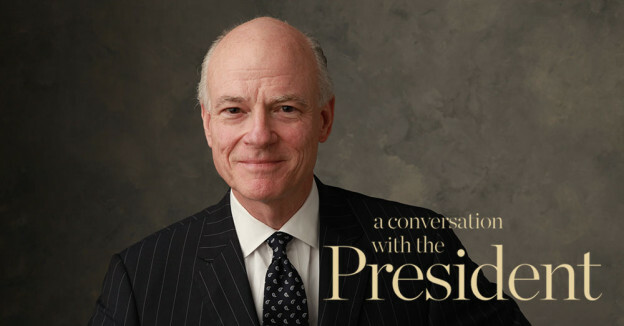 William C. Hubbard’s hard work and passion for the law has resulted in many significant achievements during his career, but none perhaps as great as becoming president of the American Bar Association in August 2014. The honor came 40 years to the month after Hubbard first walked through the doors of what was then the School of Law’s new building. Today, from his office in downtown Columbia, SC, he can see both the current law school, as well as its new home, now under construction. We recently sat down with Hubbard to discuss his time as president (so far), his vision for the future of legal services, and how Magna Carta is still influencing the world 800 years after it was sealed. You became the president of the ABA in August. How has the first half of your tenure gone? It’s been a very busy, exhilarating experience. The schedule is packed and I spend a significant amount of time trying to figure out how I can be the most productive in the 365 days I have to do this job. Some of the areas of focus that we settled on [when I was president-elect] turned out to be big issues for our country this year, and so it’s tied in well with some of the larger national and global issues. For instance, the domestic violence issue is one that we knew we were going to focus on, and then you had all the issues that came up with the NFL. Immigration has continued to be a big issue for our country, and so it was good that we planned to strengthen our involvement in this area. In fact, last summer we went to San Antonio to visit some of the detention centers when there was a surge of unaccompanied minor children. The ABA put together a working group to train lawyers to represent these children pro bono. We’d also focused on reform of the criminal justice system, and then events across the country transpired which caused some people to lose trust and confidence in the legal system. Having the ABA with a track record of criminal justice reform working on the over-incarceration issue, working on the issues of disparities in incarceration, and working on the collateral consequences of incarceration have put us in a position where hopefully we can be part of a bigger solution on criminal justice reform going forward. One area that people don’t think that much about is the collateral consequences of incarceration. When people are released from prison there are 40,000 laws in our country that prohibit them from re-entering society in a productive way. They’re denied licenses to work, they can’t get certain types of loans, access to public housing, the right to vote. Many of the things that promote re-entry into society are barred by, in many cases—not all—but in many cases, antiquated laws. As a result people coming out of prison without an ability to successfully re-enter [society] sometimes come back into the criminal justice system or become non-productive and dependent on other types of government programs. The last point, which has really been the centerpiece and ties all of the work together is this: We created a Commission on the Future of Legal Services to help close the justice gap in our country. People need access to justice, and the best studies show that 80 to 85 percent of the poor and those of moderate means in this country do not have adequate access to our justice system on the civil side. This creates frustration, and as a result people try to resolve their legal issues through other means that are outside the traditional legal system, where they don’t have the protections of our current legal system. While our current system has inefficiencies, it is built to protect the rights of people. The purpose of the Commission on the Future of Legal Services is to develop new platforms for the delivery of legal services in more efficient, cost-effective ways, and at the same time provide the protections to the public that have been the hallmark of the American justice system. Our national summit on the future of legal services will be at Stanford Law School May 2-4. We’ve been building up to that summit through a series of grassroots meetings around the country from Oregon to Missouri to Michigan to Arizona, gathering information, getting input and trying to develop best practices. The purpose—what we’re trying to do through this commission—is to break down the silos that currently have existed among regulators and innovators and judges and lawyers and academics. We created a commission to bring all of those participants in our legal system together so we can come up with a blueprint for the future. It really is important work, I think, not just for the public, but also for lawyers. This effort will help lawyers adapt to changing circumstances. We all know we don’t bank the same way we used to bank. We don’t get our news the same way we used to get our news. We’re not entertained in the same way. We shop differently. How many of us did most of our holiday shopping through the Internet rather than going to a brick and mortar store? To think that the legal system is immune from those kinds of changes is shortsighted. We must develop strategies and platforms to help lawyers meet the needs of the public, to bridge this justice gap. This topic was the focus of a session at the 2015 South Carolina Bar annual meeting. I am excited that South Carolina lawyers are considering how to adapt to these challenges and take advantage of these opportunities. Has there been a highlight so far to the first half of your tenure? I’m very encouraged by how quickly we were able to get up and running the working group on unaccompanied minor children. Within two weeks of our visit to the border we had in place a highly regarded, well-represented group from various sections and components of the ABA, and we developed training modules and training strategies to provide pro bono legal assistance. Sometimes these projects take longer to get off the ground, but that’s one where we saw a critical need, in effect an emergency, and were able to respond, and we’re now training lawyers in immigration law to represent the children. That’s been a highlight. Some of the work has been intriguing. The American Bar Association, through its Rule of Law initiative, receives grants from the State Department, USAID, and other sources to promote the rule of law abroad in areas where it needs support. Bar associations in those countries sometimes bump up against the government and need encouragement. Part of the mission of the ABA is to support the training of judges and reform of justice systems around the world, and some of my travels abroad have been interesting and challenging. I have been to Saudi Arabia on rule of law work which we hope will lead to some reforms. We were there at the invitation of the Minister of Justice of Saudi Arabia, and I met twice with the Minister of Justice. There was a trip to China that was challenging because there were instructions by my host to not be critical of the government. I did make a speech about rule of law and what it really means, but that was a challenging opportunity back in September. Additional highlights include speaking at state and local bars and at ABA section meetings and witnessing firsthand the impact that state and local bar associations and ABA sections and committees have on the delivery of justice. Another high point so far is the progress we’ve made with the Commission of the Future of Legal Services. I’ve seen a sea change in the organized bars’ recognition of the need to change, to embrace technology, and to embrace new methods of delivering legal services. I think five years ago, lawyers tended to be more reluctant to change. But lawyers, led now by bar leaders across the country, and judges are seeing that if we are going to continue to be the centerpiece of our justice system, we have to be where the people are. People are getting their legal information on their smart phones without the participation of a lawyer. We have to realize that’s what people expect now, and we have to change. And we’re making progress. With technology being a big part of the future of legal services, how do you see that playing out at law schools as we train future lawyers to work in a different way? I believe that the generation of students who are now in law school, or are just getting ready to come to law school, has the best opportunity in decades to transform our justice system. My generation has worked hard to adapt to technology, but it’s not in our DNA because we didn’t grow up with technology. The law students of today will have a legal education and technology in their DNA. Put those together and they can radically and effectively change the way we deliver legal services because it’s second nature for them to embrace technology. It’s like so many other disciplines. There’s so much information on the Internet that people go there to access. It’s not all in the control of the legal profession. We have to accept that as a fact. Most of us do a little medical research now when we have an ailment. We go to websites that at least give some background information. There are so many people now using readily available legal information and forms off the Internet, and they’re not always getting the right information. But the legal profession has to understand that’s where people are going first, and so we need to make sure we’re encouraging our clients that even if they use that kind of information, they still need a lawyer to look it over and make sure it meets their particular needs. I don’t see any diminution of complexity in our society. I think there’ll continue to be powerful legal issues that affect all of us as the population grows, as life becomes more complex. There’ll be great need for legal assistance. It’s just we need to figure out how to provide it in a way that the public wants it, not in the way that we’re necessarily comfortable providing it. Is there anything else you want to accomplish, or are there new things that have come up that you want to try to tackle while president? What we’ve seen over the last several months is a breakdown in the trust between significant groups of people in our country and the criminal justice system, and we need to try to work to create a constructive dialogue. There’s empirical evidence that there is implicit bias in certain parts of our justice system, and we need to work to eliminate or try to reduce the level of bias in our criminal justice system. The American Bar Association is working with various groups around the country to try to create a framework and a forum where we can bring people together and create an environment for constructive conversation about criminal justice reform. That would include not only those people who feel disaffected by our criminal justice system, but also law enforcement officials, prosecutors, and those who we entrust to protect the public. So we’re accelerating those efforts. It’s very important that the public has confidence in its criminal justice system as well as its civil justice system, so trying to make sure that we have systems that engender that kind of confidence is very important to the American Bar Association. In 2015, Magna Carta turns 800, and the ABA has planned many celebrations throughout the year. Is there one you are looking forward to the most? I’m especially looking forward to the 800th anniversary, June 15, 2015, at Runnymede. There will be a delegation of 800 US lawyers there with their guests. We will join leaders of the legal system in the UK and people from around the world. To be able to celebrate 800 years of a document that truly has lived on as a defining bedrock of due process and the concept that no person is above the law is a time of great reflection and celebration. How has your work as chair of the Board of Directors for the World Justice Project affected your feelings towards the importance of this document? What you see, no matter what country you visit, is a basic yearning on the part of people to have a certain degree of security and freedom. Those are natural instincts, and Magna Carta stands for the idea that no person is above the law and that people are entitled to certain processes that protect their property and security. Those principles are vital today. Magna Carta addressed those concepts, and obviously we’ve built on those principles, and we’ve enhanced them. Through our state constitutions and our US Constitution, Magna Carta’s principles were fundamental. It has had a direct influence on the development of principles in over 100 countries around the world, so it’s had a lasting impact. It’s not hard to see how Magna Carta was born, because the yearnings of the barons in 1215, though not exactly representative of the public at that time, are still the yearnings of people around the world today— to have some protection from the power of a king or a despot or a dictator and to be treated with a greater sense of fairness. That’s what all people want. You can go to just about any country, and it’s just innate in people to want freedom and security. Governments need to be representative of the people, and leaders need to look out for the people and not for themselves. We tend to focus on the differences among people. I think what I’ve learned through the ABA and the World Justice Project and these other opportunities is that we have so much more in common than we have differences. We need to focus on what we have in common instead of emphasizing how we differ from somebody or from another culture. What is the biggest obstacle facing the legal profession today? You have to break it down, I think, into civil and criminal. Despite the incredible dedication and hard work of police, prosecutors, public defenders, and judges, there are still significant problems in our criminal justice system.Constitutionally, we are supposed to provide effective counsel to everyone who faces incarceration in a criminal case. Yet we have not fulfilled the mandate to do that, even 50 years after Gideon v. Wainwright. On the civil side, the biggest issue is access to justice. Despite the significant pro bono participation by the legal profession—I would say we give more away than any other profession anywhere in terms of free services to help the poor—the model we’re using is not moving the needle. We’re not able to close that justice gap. So if, despite more effort and more hours and a culture of pro bono, you’re not closing the justice gap, then you have to look at your model and ask how you can change the model for delivery. That’s the challenge and that’s what the Commission on the Future of Legal Services is trying to do. It’s trying to facilitate a discussion and help develop a blueprint for the future. It is our hope that this work will close the justice gap and will provide new opportunities for lawyers to help people. In addition to the achievements already mentioned, you are a partner at Nelson Mullins and a member of the Board of Trustees for the University of South Carolina. How are you able to juggle all those demands, and make the time to get everything done in a day? Well, I try very hard to not let things pile up. When an issue arises I try to address it as quickly as I can. There are obviously times when traveling makes it difficult or I’m in the middle of presiding over a two-day meeting and I can’t respond to everything quickly, but I try not to let problems or issues pile up. I try to think in advance about what I have to do, what should I be doing over the next three to four weeks. Am I laying the groundwork to be able to move quickly from one place to another place, from one issue to another issue? And I try to get counsel from people whose judgment I respect, and who I know have expertise on certain issues. And frankly, there’s just no substitute for trying to work as hard as I can. You have to look at the ABA presidency as a one year opportunity and you don’t want to waste an hour, you don’t want to waste a day, and you do want to make sure that you’re spending some time every day on your strategic priorities and not being pulled into peripheral issues. You must be polite to people and you have to listen to people, but you also have to be somewhat protective to make sure that your time is spent on those issues that you have determined to be the most important. Otherwise you’ll end the year without having made a difference. And at the end of the day, that’s what I’m trying the hardest to do. Make the world a little bit better. Make our country a little bit better. Make our justice system a little bit more just. So when you do have downtime, how do you like to spend it? How do you like to relax? One or two times a year I get to quail hunt, and I enjoy walking through the woods as much as anything. The quail hunting really is an excuse to walk through the fields and the woods. I like to hike whenever I can. I try to start most days with a brisk walk which is a good way to think about the day and also to try to get a little exercise, so even if I can’t get more exercise later I’ve at least gotten a little something in to start my day. But that’s as much for mental health as it is for physical health. I do like college sports. I follow the Gamecocks. This year I’ve not made as many games in any of the sports as I usually do, but I still follow the progress of the Gamecocks, and it’s a diversion that I enjoy. And we have a grandchild. First one, and I cherish every minute and hour I can find to spend a little time with him. I have to say, I don’t know if this is responsive to a question, but I have been incredibly blessed to have not only the support and encouragement of my family, but also Nelson Mullins Riley and Scarborough. Someone gave me the advice early on when I was a young lawyer and active in the Young Lawyers Division that you just can’t do it if you don’t have the support of your family and your law firm. I’ve been blessed to have the support of both. If I get any credit for having accomplished some goals then certainly my family and this law firm should share in that. I’ll also add that I got a very good legal education at the University of South Carolina School of Law. I would put our law school, the way we teach and the quality of our faculty and just the atmosphere there, up against any law school. I’m very proud to be a graduate of the University of South Carolina School of Law, and I have seen our graduates around the country perform as well or better than graduates of other law schools that purport to be higher in the rankings. Not many law schools can claim presidents of the American Bar Association, the American Association for Justice, the Defense Research Institute, ABOTA, the Conference of Chief Justices, the Chair of the Executive Committee of the US Judicial Conference, and a number of other leadership positions. We also have produced great trial lawyers and business lawyers out of this law school. There’s just great collegiality in our bar, and I think a lot of that comes from the fact that most of us went to the University of South Carolina School of Law and we have that common bond. And it makes for a better bar. The School of Law’s new home is currently under construction, and set to open in 2017. Is there one feature you’re most excited about? I’m very excited about the courtyard. If you look at where education is today, it’s all about teamwork, people working together, so it is important to create spaces for interpersonal connections and conversations. The courtyard will be a tremendous benefit, and the whole layout of the building facilitates the interaction between faculty and students.Creating common spaces is really important and will make for a much more collegial atmosphere. We need all the collegiality we can get. Another accomplishment, I think, in the planning of it was making sure that we could get the power and utility lines underground around the law school. Otherwise you would have those power lines right outside the windows on the Gervais side, which would inhibit the view and the prestige and beauty of the building. Do you have a favorite legal movie or TV show or fictional lawyer that you enjoy watching? I am dating myself, but I enjoyed Perry Mason as a child. Perry Mason was really good. He always got a confession from the witness stand. I am still waiting to get my first confession during a cross-examination. I really love lawyers. They make great company and generally have varied interests and are about something beyond themselves. Lawyers are the great protection for what one of my mentors and predecessors used to call “our great system of ordered liberty.” Bob MacCrate was ABA president when I was chair of the Young Lawyers Division, and he used to refer to “our great system of ordered liberty.” To have that system of ordered liberty work for the people you must have a strong legal profession, you must have a strong organized bar, and you must have an independent judiciary.